The best way to review your research I think, is to review your "assets", organise and re-organise. Where to start with my re-organisation? Such a big job. Something I got better at, as the years went by. However, I had no idea it would get so big - nor accumulate so many bits of paper and so many files! I also have a lot of duplication, due to not realising I already had something. I am a computer-person, so decided to start organising my electronic world, then base my paper filing on it. I also decided to research how other people organised their filing too, to see if I could learn something new or different. Funnily enough, a tweet came through on Twitter from @LisaCooke of GenealogyGems, about a YouTube clip she'd made for Family Tree magazine. It seemed methodical, so I thought I would follow it. After following it through step by step, I decided that the instructions were very clear and concise and easy to follow. I made some minor changes and additions. I added a folder "Research Notes", which will keep any files I create while researching, as well as anecdotal information I have or will collect in the future. I like things to be easily found. 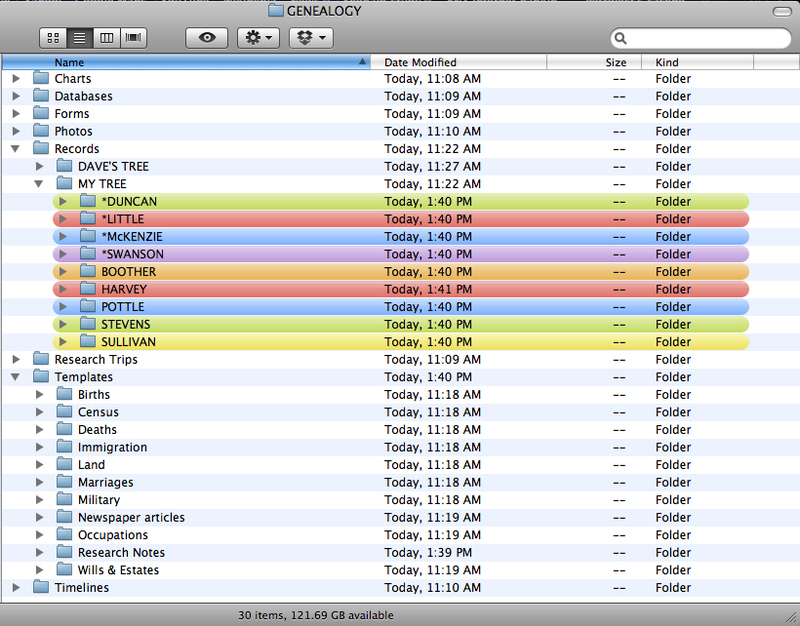 So I've asterisked my maternal-line surname folders, so that they will stay together at the top of the MY TREE folder. 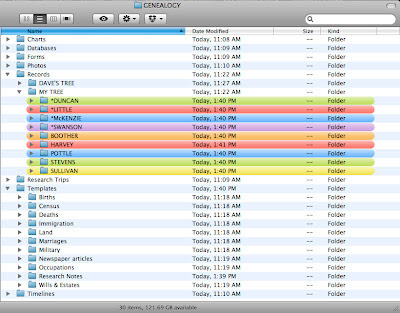 I've also colour-coded the surname folders. Unfortunately, the Mac only has a choice of seven label colours including boring grey. So I decided to give my grandmothers line on both sides blue, and my grandfathers line on both sides red. When it comes to stationery (lever arch folders etc), I might try and differentiate the same colours by using shades. Light blue and dark blue for example. I figure that these surname folders should probably be copied into other folders as well, such as Photos. I am pretty happy with my start at the electronic tidy up. Now I just need to fish out all the existing electronic files and put them in the correct place. And then scan the ones I haven't done yet, and file those ones correctly. Might take me a while, as I will be doing this methodically, and may have to check backup drives to ensure I have them all! Meanwhile, I have enjoyed taking the approach of starting from scratch and doing the rebuild from the ground up. How fantastic to find your blog as I started research years ago and am just about to start a methodology course to help me collate mountains of info in my journals, printouts etc! I also have Reunion which I love but don't really know how to use to it's full potential. I have never been able to find a course either at my local genealogy associations. Thanks, you've inspired me to get cracking again today! Congratulations Lewis! Thank you so much for taking the time to share this exciting information.